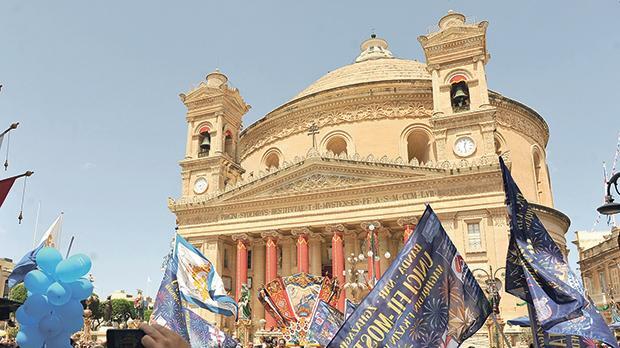 This is the first year that the Mosta Rotunda celebrated the feast of The Assumption of Our Lady as a Minor Basilica. For this I would like to thank Pope Francis, Archbishop Charles Scicluna and the previous archpriest, Fr Albert Buhagiar, whose dream it was to see the Mosta church given the title of basilica, and who asked the Archbishop to push for this. Thank you, Pope Francis, for accepting this request. I would also like to thank the current archpriest who did his best for all this to succeed, but did it succeed? In my opinion, no, and I would like to ask a number of questions. Why was that beautiful statue where baptisms used to take place moved and taken to the middle of St Joseph chapel? A statue of Moses was put in its place, which doesn’t really make sense. Did the Archpriest receive any advice about this from anybody? The main altar, commissioned about 20 years ago by the archpriest at the time, was artistically manufactured in wood, at a cost of thousands of Maltese liri, and should have been made of marble. Sadly, I heard that it was given to somebody in Qormi. I think nobody has the right to give things away which people had paid for, not even the Archbishop. Was it not wrong to break the beautiful marble floor around the main altar just to put in a few electric wires? True, everything was put back in place, but it would have been better to save all that money so that one day the roof of the dome could be repaired. Who decided all these things? Was it the Archpriest or some people around him? It was a great joy for me when I heard that the Mosta Rotunda was elevated to a basilica, but that joy did not last for long when such work started to take place. Could not these people find a place to keep the wooden altar in Mosta? Was the Oratory not good enough to have it?